Investing is like golfing. We know what to do when we swing. However, when emotions or distracting thoughts get in the way, we start hitting terrible shots. Picking good investment funds is similar. Most investors know what they should do: stick to funds with a steady, consistent track record and avoid those that assume excessive risk or charge high fees. Yet, emotions often get in the way, with all forms of distracting temptations. These include the deadly emotional mix of greed and fear. That’s where the MoneySense Honour Rolls can help you sort the mutual fund wheat from the chaff. We choose the Honour Rolls based on an objective formula. It leaves no room for emotions or subjective bias. Our methodology is based on proven determinants of future performance, namely a mix of consistently superior results, low risk and low cost. Thanks to such rigid discipline, most Honour Roll funds (on average more than 70%) have out-performed the competition for nine years in a row. 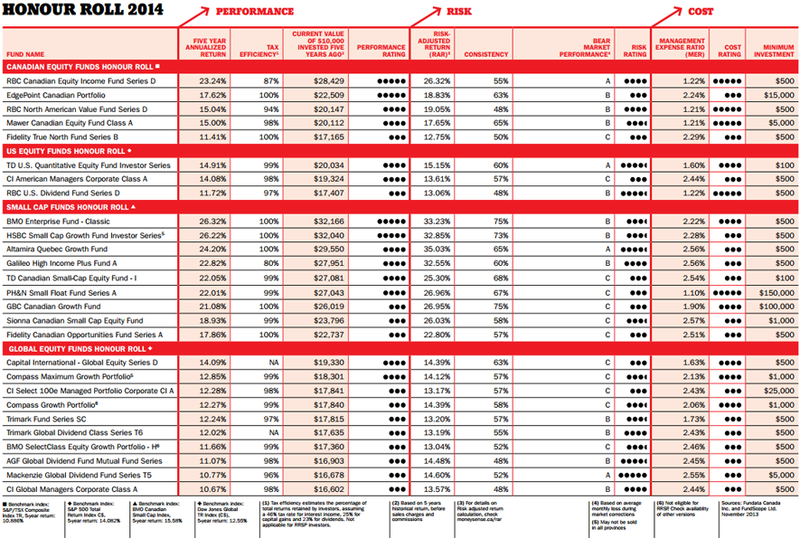 The table on p. 44 depicts the percentage of above average performers from each year’s selection. We have followed the same selection methodology as last year, so disregard balanced and bond funds. For both categories, I remain skeptical about fund managers’ ability to beat the benchmark due to high fees, especially with fixed income paying so little. Therefore, I reiterate last year’s suggestion that you simply invest the fixed-income component of your portfolio in a cheap bond ETF. (See the ETF All-Stars for four bond ETFs.) But equity mutual funds can add value, so use the Honour Rolls to populate the equity component of your portfolio allocation. In the Canadian equity category, RBC Canadian Equity Income remains in the lead, after reporting another year of superior performance. The fund benefited from strong security selection in the energy and industrial sectors and from underweighting weak precious metals stocks. Based on recent distribution data, its estimated dividend yield, net of expenses, remains healthy, slightly exceeding 4% per annum. Edgepoint Canadian portfolio is another solid performer with an acceptable risk profile. Here, historical results suggest a certain bias in favour of value stocks, both large and small cap. 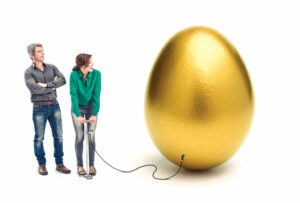 However, if you seek dividend income, this fund is not for you. In the Canadian Small Cap category, our winners share common characteristics. These include a bias for value stocks, low portfolio turnover that adds to the cost advantage and no dividend income. BMO Enterprise Classic is a perennial Honour Rolls fund. It earned its top rank thanks to exceptional results the past year, posting a solid 48% one-year return as of Nov. 30, 2013. This was attributed to powerful sector allocation, as management smartly underweighted the weak materials sector and emphasized the strong technology and industrial sectors. Security selection helped. Likewise, HSBC Small Cap Growth benefited from underweighting materials and avoiding precious metals. The fund delivered excellent results, extending an overall respectable track record. In the U.S. Equity category, TD U.S. Quantitative has been a solid performer with acceptable bear market performance. The portfolio adviser attributes the success to the fund’s preference for small-cap issues. It follows an investing discipline that favours value stocks based on book value multiples, or companies with potential for earnings growth. My main quibble is its ultra-high portfolio turnover, reported at 350% to 400% during the years 2011 and 2012, which significantly adds to investment cost. CI American Managers is an above average performer that doesn’t bet the farm on any one sector or stock. Its widely diversified portfolio and bias to value stocks contribute to a decent risk profile, with acceptable portfolio turnover just above 100%. Its five-year return is similar to the benchmark but the active portfolio management seems to have added value once you consider the reduced risk and ability to overcome the MER burden. In the Global Equity category, Capital International has delivered superior returns each of the past three years. Its five-year return significantly exceeds the benchmark without assuming incremental risk, reflecting value added from active portfolio management. Its investment style is a blend of value and growth, with the advantage of low portfolio turnover averaging 20%. Compass Maximum Growth Portfolio owes its seat on this year’s list to its long-term track record. It’s underperformed its peers of late, due to its high weighting of Canadian stocks. These underperformed global markets due to the weak resources sector. Still, it remains a solid choice and you should not be swayed by such short-term weakness. Note: BMO Entreprise Fund Classic is no longer available to new investors. Overall ratings in each category go from one circle (poor) to five circles (excellent). Any Honour Roll fund is a good buy, but some may be better than others. For instance if investing outside an RRSP, pay particular attention to “Tax Efficiency.” This measures how much of a fund’s return has been lost to taxes on distributions. (Funds that don’t distribute cash don’t lose anything, so are rated at 100%.) In general, the higher this number, the better for funds held in taxable accounts. All investors should also consider risk. “Risk-Adjusted Return” shows how much return each fund has achieved in proportion to its risk—again, the higher, the better. To play it safe, look for funds with a high “Consistency” rating (which shows the percentage of months in which a fund has performed better than its peers) and strong “Bear Market Performance” (the best funds get ‘A’s and so on down to ‘E’s).